In recent years, scientists have been able to confirm that zebras’ stripes protect them from biting flies. But in a new study published in the Feb. 20, 2019, edition of PlosOne, Drs. Tim Caro and Martin How — from the University of California, Davis, and the University of Bristol, respectively — set out to find out why this occurs. The pair, along with other team members, conducted their experiment at a farm in Great Britain that houses both zebras and horses. In addition to physical observation and detailed videos recording the flight trajectories of horse flies (Tabanidae), they also dressed both types of animals “sequentially in black, white and then black-and-white striped coats,” according a UC-Davis news article. At a distance, the flies were attracted no matter the coat pattern, the study found. But once the flies got closer to the zebras, they tended to “fly past or bump into them. This indicates that stripes may disrupt the flies’ abilities to have a controlled landing,” Dr. Caro said in the article. 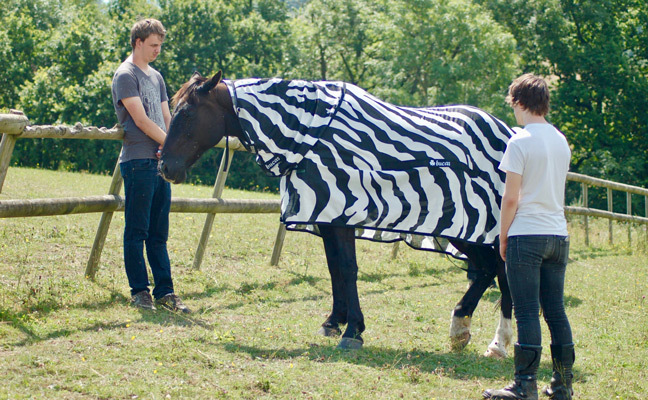 The study was able to replicate this when the horses wore striped coats. “Stripes may dazzle flies in some way, once they are close enough to see them with their low-resolution eyes,” Dr. How said in the article.